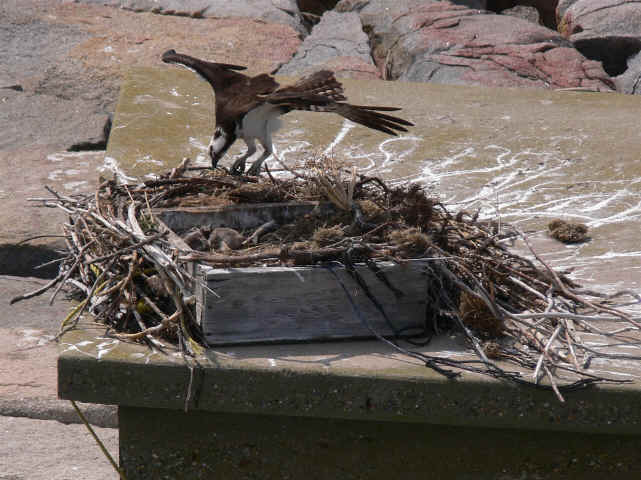 These shots were taken by Barb Moulinier during the June 2, 2007, tour, capturing the resident osprey pair on the inner breakwater. 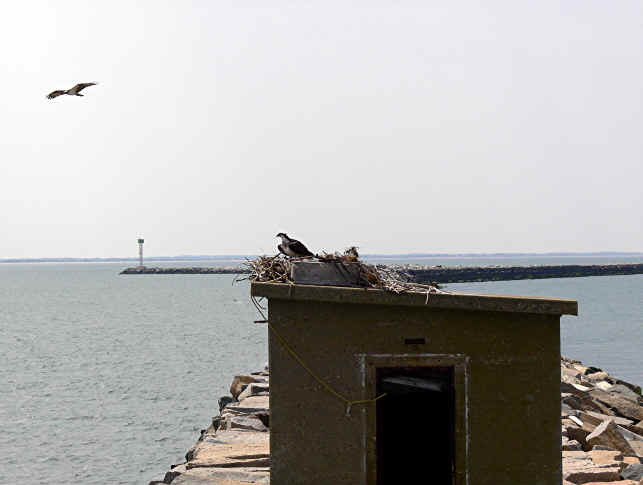 The osprey have lived on the old oil house for as long as the Foundation has been conducting tours to Delaware Breakwater East End Lighthouse. At first, they hated the company of Foundation work crews and tour participants. They were even a bit billigerant about the matter. But eventually, the pair accepted the fact that humans were now sharing their breakwater home. That's not to say they LIKED it, but they settled into a watchful live-and-let-live mode. This year the osprey pair have a nest full of chicks! On June 2, they had just escaped the egg and were only furry blobs....but already mother was supplying fresh fish for dinner. By the tour on June 16, the young'uns were active "teenagers", flexing their wings and appearing ready for flight. We're eager to see if anyone caught the bigger chicks in action during this latest tour.